The Lotus flower symbolizes the blossoming of hope and happiness. It also stands for prosperity and denotes purity. 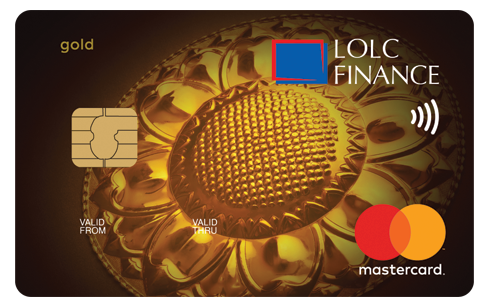 We, at LOLC Finance welcome you to join with the Mastercard Gold Credit Card and to take advantage of the wide range of the benefits which will enable you to 'Fuel the goodness in you'. Copy of a Utility bill dated within last three months under the prospective card holder’s name , if the permanent address differs from the NIC address. Employment confirmation letter to verify the status of the employment, length of service, details of the salary, EPF details and designation. Form 1, 2A and Form 20 (If applicable) in case the company is a limited liability. Letter from auditor confirming annual income for last 2 years. Cash payments could be made at any of the LOLC Finance Branches. Payments made on Saturdays will be processed on the next working day. Cheques should be crossed (A/C payee only) and should include the Card number. Eg. Pay LOLC Finance PLC, O/A card no xxxx xxxx xxxx xxxx. Third party cheques drawn in favour of the cardholder will not be accepted, unless they are made out as in the above example. Funds will be available in the credit card account subject to cheque realization. Please leave minimum of three working days and maximum of six working days for processing and clearing of cheques. Cash cheques and post-dated cheques will not be accepted for payments. Please allow minimum nine working days for payments to reach the account if cheque payments are made by post. All cheques sending through post should be addressed to “Manager - Credit Card Operations, No 438, Havelock Road, Colombo 05”. The cardholder can avail himself of the Standing Instruction facility to debit his LOLC Finance savings account for settlement of the credit card bill. The Cardholder can choose a percentage between 5% - 100% of the statement balance to be debited on the due date. 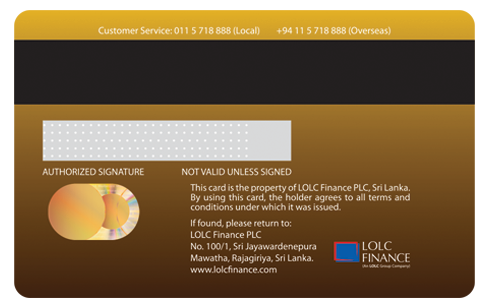 Use LOLC REAL TIME to transfer funds from your LOLC Finance savings account to your credit card account free of charge. No.438, Havelock Road, Colombo 05 Sri Lanka.